Global Training Academy's police dog and handler training is creating the world's best detection dogs. Global's patrol dogs are deployed worldwide. And we now offer boarding services. Workplace facility drug or bomb search. 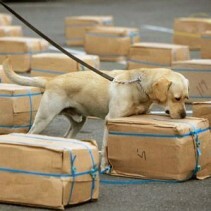 Contract our teams to visit your workplace or facility with first class drug or bomb search dogs to make sure your facility is clear of contraband. See why we're the best. Any kind of drugs will be found in an assignment. Our search teams have done excellent work over the past 30 years. As with all of our working dogs, Global Training Academy’s bomb dogs are simply second to none. Our world-class training process ensures that each and every one of our graduated handler and dog teams have completed the most extensive training program the industry has to offer. Working Dogs for sale - We have provided extensive working dog training to 2 types of K9 Working Dogs. Single Purpose Dogs and Dual Purpose Dogs. Welcome to Global Training Academy, the world’s foremost authority on K9 working dog training. We are proud to offer a wide variety of industry-leading programs in the training and certification of arson dogs, drug dogs, detection dogs, bomb-sniffing dogs/explosive detection dogs, and of course, police K9s. Global Training Academy opened its doors for the first time in 1984, and has been proudly setting the international standard forworking dogs ever since. Although we are based out of Somerset, Texas, just outside of San Antonio, we pride ourselves on the international scope which our services have attained. At present, Global dogs are hard at work in every corner of the world; from Asia, Africa, and the Middle East, to right here are home. 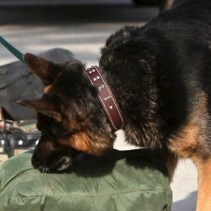 In fact, we currently have more than 450 K9 dogs deployed within the United States Department of Defense alone. If you are in the market for a working dog that is second to none, you have certainly come to the right place. Before Global entered the industry almost thirty years ago, there were no generally accepted standards for working K9 dogs within the civilian world. By applying the same stringent protocol used by the US military, Global’s founder (and former Course Chief for the Military Drug Dog Training Course at Lackland Air Force Base) Dan Hayter, has been able to quite literally set the bar by which all other dog trainers are now measured. On the international level, this standard has now become an accepted baseline for measuring the proficiency of working dog and handler teams. This process is not easy to complete, but you can count on the fact that any team that has been certified by Global has completed the absolute highest quality training available. After completing an initial certification process, each handler and K9 dog team must undergo a thorough, three-step evaluation process, which measures real world tactical abilities. From there, a final written examination must also be completed before the dog and its handler are certified. As a proud contributing member of both our local and national business communities, Global Training Academy is registered with the DEA and the Texas DPF, as well as the ATF for use of explosives during training procedures. We also maintain full membership in the US Chamber of Commerce and the San Antonio Better Business Bureau. In any corner of the world where you will find working K9 dogs, you will find the Global standard at work. From small, private industrial firms right in your own back yard, to international police forces and foreign governments, our dogs are simply the most sought after working dogs on the planet. Each and every one of our K9 dogs is trained with nothing but performance in mind. From the very outset, we have chosen to take on the challenge of becoming the absolute best in the world at what we do. This is why we have instituted such difficult certification procedures, and it is also why we are internationally known as the gold standard in the training of working dogs. Each of our K9 dogs is trained with handler protection as its top priority. 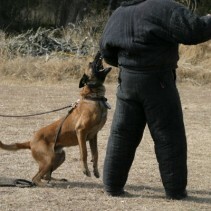 In the event of an attack on its handler, our dogs will aggressively defend, with or without command. At Global, we firmly believe that it is this type of trust which establishes the bond necessary for a successful working relationship under difficult conditions. Not only do we pride ourselves on providing the best dogs in the world, but we also take great efforts to ensure that each of our customers is well taken care of. We perform regular follow-ups with all of our clients, and make certain that follow-up training is always available. 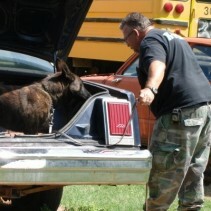 In fact, it is actually quite common for dog and handler teams to return to our training facility for ongoing training. This can be done with the aim of refreshing skill sets which are not utilized on a daily basis, or even to add additional skill sets so that a dog can become more versatile in the field. In the world of dog training, Global Training Academy simply has no match. Across the country and around the world, any working dog that has not been trained by us is, at the very least, being measured by our standards…and the vast majority simply do not make the cut. So if you are looking for a world-class K9 capable of performing under a variety of conditions, look no further. Global has got the right dog for you.